My AC blower is in the attic. It has a number of low voltage control wires that are not in a junction box. 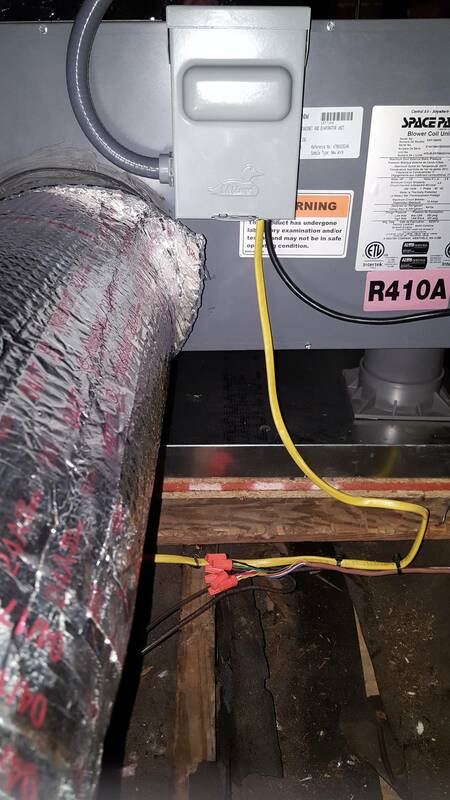 I am planning on blowing insulation into the attic, but I am not sure what to do about the wires. Should they be in a junction box? It is not required, but it can be a good idea. Personally, I would prefer them to be in conduit (e.g. ENT/smurf tube) with splices in junction boxes. Just like with electrical wires, it will protect them from damage while providing accessibility for splices. Low-voltage wires are typically thinner and less durable to begin with, so protecting them is a good idea. Conduit may be overkill but it also makes it easier to pull new wires later on if needed: do a search on this site for people running into trouble with incorrect/insufficient thermostat wires for reasons why this is a good idea. While the NEC does not concern itself with low-voltage wires (mostly, they are mentioned in a couple of places), nobody would fault you for providing the same levels of protection and accessibility for these wires. It's not required, but there's no harm in doing so. I'd mostly detach them from the yellow cable and bring the nuts up above the insulation level in case you need to find them later. Not the answer you're looking for? Browse other questions tagged wiring low-voltage or ask your own question. At what voltage are “low voltage” junction boxes not appropriate? Can I use normal metal electrical box for outdoor low voltage installation?